A new imaging project at the Morgridge Institute for Research might be the biology equivalent of a 19th century expressionist painting. Think Van Gogh's "Starry Night," a constellation of tiny lines of color combining into a powerful image. Except the canvas of this research project will be a zebrafish, and the paint will be individual cells of a developing embryo. Jan Huisken, Morgridge medical engineering investigator, is part of an ambitious project to develop a complete cellular blueprint of zebrafish development, from the first ball of cells to an adult fish. The project could have great benefit to regenerative biology, by precisely defining what role each individual cell plays in the full development of a complex organism. The project is one of the 2018 winners of the "High-Risk, High-Reward Research Program" announced Oct. 2 by the National Institutes of Health (NIH). The project is one of 10 transformative research awards from the NIH Director's Office that funds investigators whose research ideas "could potentially create or challenge existing paradigms." Three labs will contribute distinct expertise to the effort. Project lead David Traver, a biological science professor at the University of California-San Diego, develops unique tools to identify, colorfully visualize and track zebrafish stem cells. Zhirong Bao, a developmental biologist at the Sloan Kettering Institute, provides computational tools to track the movement and function of cells over time. And Huisken provides the imaging expertise through light sheet microscopy, which can non-invasively image living zebrafish embryos for as long as 48 hours. Huisken says the project's strongest suit is combining these three domains — labeling, imaging and tracking — to do something no single lab could do alone. 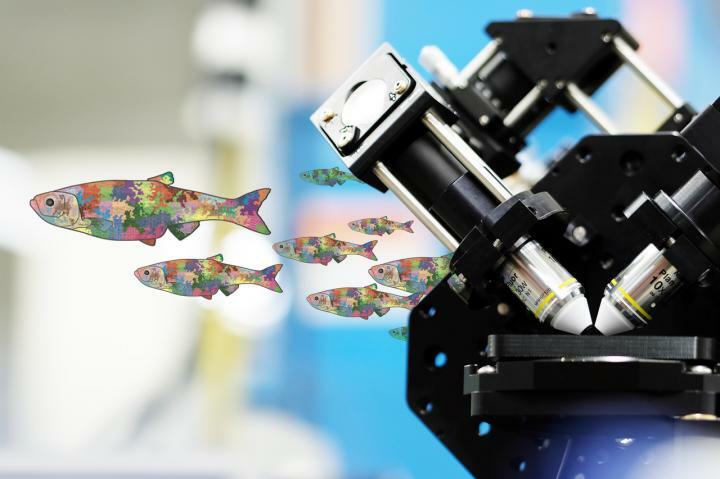 "We want to achieve something in the zebrafish that has only been achievable in much smaller organisms," says Huisken. "We envision creating an atlas that scientists can look into and see how all of the cell lineages have taken shape." Today, the completion of developmental blueprints has been restricted to the model organism c. elegans, a relatively simple worm whose early development is scripted almost like a computation. But in more complex organisms like the zebrafish, there is far more variation from one individual to the next, making it harder to determine cellular fates. This project will use laser marking systems to randomly assign a different color to each of hundreds of early-stage cells. Every cell will be a slightly different color than their neighbors, allowing researcher to track their migrations. Interestingly, the daughter cells of each of these cells will carry on the same color as the parent. Huisken says this will result in a mosaic of color patterns across the fish. If a cluster of heart cells is a particular shade of green, they will be able to map those cells back to the original source. The live imaging via light sheet microscopy can only be realistically done through the first few days of the embryo, Huisken says. At later stages of development to adulthood, the fish will be fixed, cleared and rapidly imaged with a different light sheet configuration. Another unique contribution of the Huisken Lab will be a microscope nicknamed Flamingo. This iteration of a light sheet microscope is shrunk down to the size of a suitcase that can be shared with biology labs that have fragile specimens. The labs at UCSD and Sloan Kettering will be able to use Flamingo to perfect their methodologies, while the high-throughput imaging can concentrate at Morgridge. Zebrafish area ideal model organisms for many reasons. They are translucent, grow rapidly and are highly prolific — a single couple can produce a thousand embryos a day. They provide a vivid window into how each organ is formed.